Flexible, cost-effective, and one of the ‘leanest’ types of materials handling system around, Intermediate Bulk Containers (IBCs) make perfect sense for any manufacturing industry that needs to move powders, granules or tablets between processes. We explain how a two-floor pharmaceutical facility can make the best use of IBCs. When it comes to the pharmaceutical manufacture of oral solid dosage (OSD) products, three things are of the utmost concern: quality, safety, and profitability. This is especially true in the manufacture of generic OSD products, where quality and safety demands are stringent, but lower profit margins mean that high volumes must be sold to get a sound return on investment. themselves. 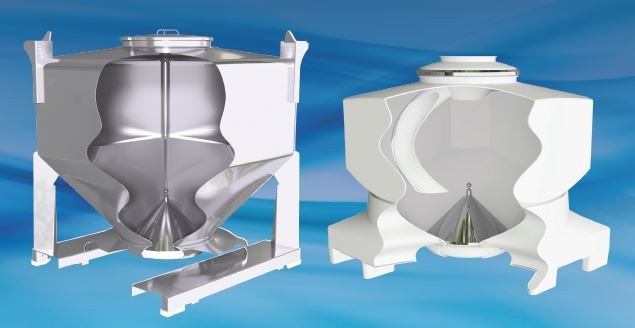 IBCs, especially those made with Matcon’s precision-engineered Cone Valve technology, are the ultimate ‘lean’ solution for handling powders, granules or tablets. The ‘lean’ philosophy is all about eliminating waste, because waste – whether that is lost ingredients, spoiled batches, or unnecessarily spent time or effort – all amounts to wasted money. Using an IBC-based production system is cleaner, more efficient and more flexible than other types of traditional manufacturing lines – talk to one of Matcon’s expert consultants to find out more about the benefits! 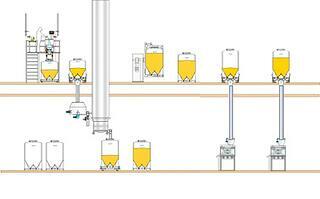 How can I integrate IBCs into my pharmaceutical facility? If you’ve been convinced of the benefits or IBCs as a materials handling solution for your facility, your next questions might be related to making this system work in the space that you have available. IBCs can be seamlessly integrated into almost any size or shape manufacturing space, with significant efficiency savings. If you have a two-floor pharmaceutical facility, the good news is you have a major advantage: you can maintain a top floor that is dedicated to materials handling and blending, while the lower level can be given to tableting and packing procedures. This is a particular benefit for pharmaceutical manufacturers, where adherence to GMP regulations means that it is essential to isolate potential sources of contamination to generate safe, high quality OSDs. When handling powdered ingredients, a major source of waste is often product lost when transferring raw ingredients from their delivery containers, to the blender and further processes. Using a Matcon IBC, ingredients can be discharged directly into the receptor, this is also the blending vessel, thus it eliminates an unnecessary step. What’s more, closed connections before, during and after IBC discharge will ensure a dust-tight transfer, and avoid the risk of contamination and cross-contamination. With two floors, vertical transfer is a definite possibility, so you can let gravity do the hard work of moving materials between processes. Because IBCs are located on a single floor it is even possible to remove manual IBC handling and automate these movements. Matcon IBCs can also be fully integrated into the rest of your production line. Since they can handle solid granules or particles of any size, including pressed tablets and capsules, IBCs make handling your intermediate and end-stage products easy and efficient, eliminating the waste often caused by manual processing methods. and safety hazards, and are cheaper to buy/rent. Alternatively, the additional space afforded by a two-floor facility means you can think bigger: achieving larger batch sizes without the extra costs associated with cleaning and storage space.